I think classroom environment is important. It’s important that all that your students’ environment is not only fun to look at, but engaging and meaningful as well. Whenever possible, I try to ensure that whatever I put on my walls can serve many purposes including beautiful decor. Hey – we spend a lot of time in there – it needs to look good! This summer I shared the BRIGHT and BOLD Classroom Essentials Focus Wall and Calendar cards that I am using in my classroom. I found that my alphabet cards could use some overhauling as well. Incorporated bright and bold colors. Highlight short vowels for easy recognition. 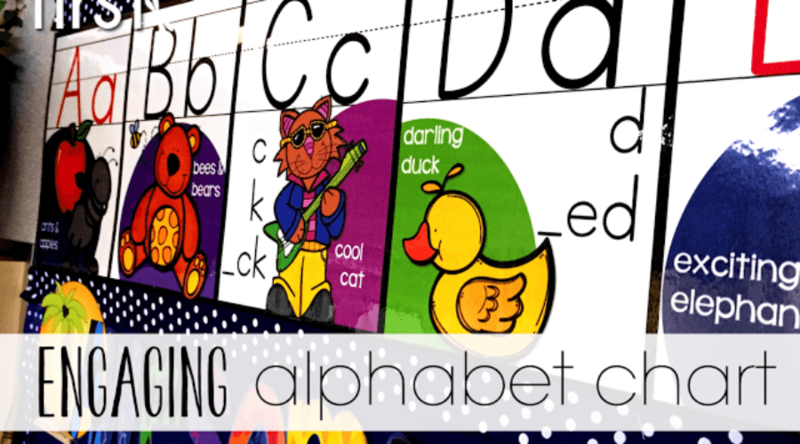 Include “sing-song” like wording for fun alphabet & phonic rule recital. I made the cards to match all three of the Classroom Essentials color schemes. My favorite is the BRIGHT & BOLD. The colors just pop off the walls. There is also a BRIGHT and LIGHT set and and red and black (ladybug) set. The phonic rules on the cards follow the same theme so there is unity throughout the room. The kids can use the cards as helpers when the read and write. The lettering is large and the images are easily identifiable. I included all of the phonic rules that we cover in class. We refer to the cards often and recite the patterns daily. That way my kiddos know where to look for help when trying to spell a particular sound. I want the kiddos to push themselves to dig deeper and expand their schema. All of the spelling rules for different phonic patterns are on the cards. Just seeing these rules on a daily basis helps identify the sounds when they come to certain letter combinations when reading. Phonics cards are amazing tools. I LOVE that they are adorably cute AND purposeful in content. My kiddos who are struggling with letter/sound recognition respond in the most fabulous way when I say “/n/, /n/, /n/ NIGHTTIME NINJA” or “Check out the Painting Pig card for the correct way to write that P”. This newest addition to my room matches the Bright and Bold Focus and Calendar Wall Classroom Essential Cards that are already on our walls. The Alphabet and Phonics cards include a set of rhymes/chants that you can do with your kids as part of your phonics practice routine. We “read the cards” every day. Chanting and acting out the different sounds and images not only helps to cement the sounds and spellings in a visual way, but auditory and kinesthetic as well. Each set corresponds with the matching color scheme of Classroom Essential Focus Wall cards and are also available as a BUNDLE. Make it engaging and useful and the kiddos don’t even realize they are learning just by looking around the room! It’s a win-win all around! Love these! We teach D'Nealian though. Do you have a set in D'Nealian?